Regis Glorieux, the Co-founder and General Director tells us why, and explains the strengths and the outlook this new stage will give us. Twenty-four years after having opened, Vatel Bordeaux is undergoing a new phase in its development. The school, which already has a restaurant and a four-star hotel in the Chartrons district, will expand in September 2018 in the very trendy Bacalan district with its ideal demographic, economic, and touristic environment. 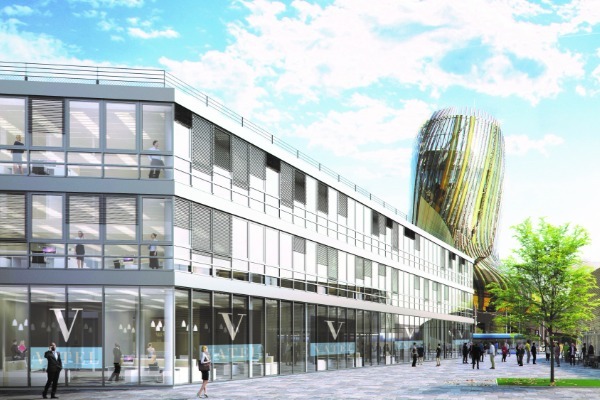 A second campus will open near to 'the Halles' and across from the Cité du Vin. 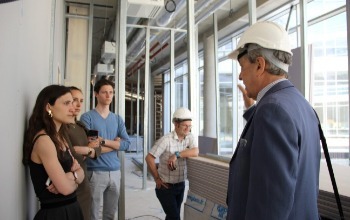 Why open a second campus for the upcoming academic year? After we had moved into the new Chartrons Campus in September 2015, we knew quite quickly that we had to expand. Our Campus’s new local and virtual visibility thanks to its high-performing facilities (a four-star hotel and an eco-labelled restaurant, a tasting room, a panoramic meeting room, etc. ), boosted the number of students we recruited, going from 340 in 2014 to 670 in the 2017 academic year. Our seminar and banquet activities are also currently hampered because of the lack of available facilities. And at the same time, we wanted to continue our long-term strategy in assessing quality, which means having our facilities and additional equipment in a privileged environment. When will the campus be opening? We’ll be moving into the new facilities at the end of July 2018 and after moving everyone in and having the safety commission validate the buildings, we’ll be ready for students in September 2018. Where is it located? Why did you choose this location? This 2nd Campus is located in the Bacalan, one of Bordeaux’s newest and trendy districts.We’re just across from the Cité du Vin, which had over 450,000 visitors the first year it opened in 2016-2017, next to the Halles de Bordeaux that opened last November, an open market with thirty regional producers. And in 2020, on the same site, there will be a student residence with 160 studios and a 230-bed youth hostel that we will also manage, a five-star hotel and a three-star hotel with 130 to 150 rooms each. So, it’s a true hotel and tourism hub that’s being created, and this in the Bassins à Flots environment, which is Bordeaux’s marina, where a Radisson Hotel is being built and where the Sea and Sailing Museum will open in June 2018. The head office of Cdiscount is also there and the Crédit Agricole’s head office is being built there, etc. We’ll be right in the very heart of one of Bordeaux’s largest economic and touristic locations. How many students will you have? For 2020 and the following years, we’re expecting 750 to 800 students. There will be about 500 students in undergraduate Bachelor studies and about 250 to 300 students in graduate MBA studies. Right now, the new Les Halles Campus can hold 400 students at the same time. We’ll be having our Bachelor students there, but you have to remember that because of the way our curriculum is designed, we have many professional applications and internships, meaning that all the students are never at our school at the very same time. The Chartrons Campus will target graduate MBA studies, and in particular the International Wine & Spirits Management specialization. What advantages do students have when they’re looking for internships? Our students do their internships both in France and throughout the world. There’s no difference. However, our undergraduate students have a curriculum that includes academic courses followed by practical application courses. Having the hotels near is thus something that will make life much easier for them. What are the advantages for the daily lives of students (restaurants, transportation, leisure activities, etc.)? The site already has a tramway stop here (Cité du Vin stop), so it’s easy to access and easy to go downtown. 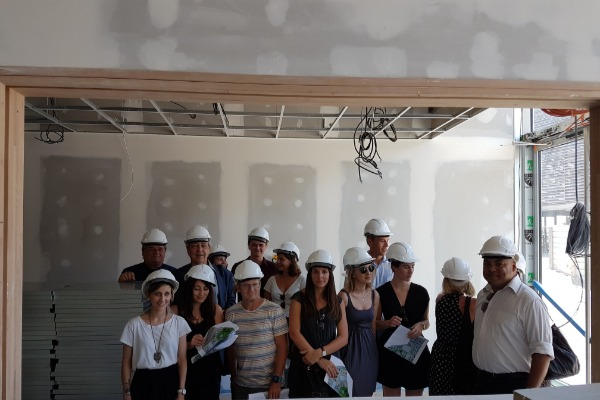 As for housing, restaurant services and leisure activities that are near, unfortunately you’ll have to wait for a year before the residence and the youth hostel will open, as this is where the restaurants, gym, co-working areas, games, etc. will be located. So be patient. Why should students decide to go to Vatel Bordeaux? We do everything possible so that our students feel at home here at school and are always there, ready to listen and are open to all constructive suggestions. We want to expand cultural pluralism by strengthening the integration of foreign students attracted by the city of Bordeaux’s ever-increasing prestige. And as for Bordeaux’s hotel and touristic environment, which had lagged behind for quite a while, we’re now on par with other large European cities. How is the Campus located 4 cours du Médoc a complementary one? I wouldn’t say it’s “complementary.” I prefer the term “additional.” We’ll have an amphitheater that can seat 80 people where we can have projections of films, conferences, events, a flexible and interactive IT room; a tasting room for 36 people as compared with only 24 at the Chartrons Campus. What companies are in the vicinity? I already gave you the names of two large ones: Cdiscount and the Crédit Agricole. But there are a lot of small and medium sized ones too. A digital corporation hub was created in the Bassins à Flots. This district has had 2,000 people move here in the past few years. What outlook do you see for the next three years for Vatel Bordeaux? Our mid-term strategy is to increase our quality. We grew quickly, perhaps even too quickly while keeping technical and human qualities which must remain our key strengths. We have to reinforce our two fundamentals, which of course are important in any company, but even more so in a training and educational company: we have to keep on adapting our curriculum to changes in our lines of work, the hospitality and tourism management industries. These fields have undergone an upheaval and will continue to do so with the digital invasion (Booking, Airbnb, connected objects, robots, etc.). This means you have to conserve human dimensions and their emotive loads, their uncertainty, imagination, unpredictable character, and thus the obligation to be able to adapt yourself in all circumstances. We’re extremely confident, which in my opinion is essential to fulfill our mission correctly : preparing the younger generations to be responsible in their lines of work and more generally speaking, for the entire planet. They’re the ones who will be holding the reins for the next 50 to 70 years. And they’ll have many environmental, political, and cultural challenges to overcome all throughout the world!